The vast majority of Californians put ethanol in their car – it makes up about ten percent of every gallon we buy at the local filling station (not including diesel). 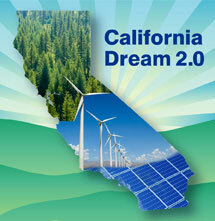 This means that every year, drivers in the Golden State use about 1.5 billion gallons of this alternative fuel. Such widespread use of this fuel begs the question: What is ethanol’s environmental profile, and is everything being done to produce it as efficiently as possible? Over the years, a great deal of effort has gone into answering the first part of the question, and the answer is: it depends on many factors. Water use, land use, and fertilizer use are all factors associated with growing ethanol feedstocks (typically corn) that can influence whether the fuel is an environmental winner. Aquifer depletion, unsustainable land clearing, and fertilizer run-off are just a few of the potential problems that can emerge when ethanol production is performed in a short-sighted manner. Similarly, feedstock type, biorefinery efficiency, and ethanol yield per ton also matter and can impact whether ethanol helps from a climate change standpoint. Cumulatively, each of these factors can influence the environmental profile of California’s third-most widely used fuel. Who: Edeniq employs 50 people in California and develops and produces technology that makes existing ethanol plants run more efficiently and use more of the corn plant. What: Edeniq produces the Cellunator and the PATHWAY platform, which work together to break down plant biomass and produce cellulosic ethanol, and bolt-on technology that produces cellulosic sugars for future processing into fuels. Where: Edeniq is based in Visalia, and partners with Pacific Ethanol, which has plants in Stockton and Madera. Why: Edeniq is contributing to a low-carbon economy by making ethanol plants in California more efficient and productive at a low capital cost. While minds may differ on how the total environmental costs and benefits of ethanol stack up, there are some companies like Visalia, California-based Edeniq who are stepping up to answer the second part of the question, delivering innovative techniques to produce ethanol as efficiently as possible. Historically, corn ethanol production was accomplished by fermenting the starch part of the corn kernel, with the ancillary biomass byproducts – the remaining protein, fat, fiber, and other nutrients – often getting processed into livestock and poultry feed. Today, however, through products like those offered by Edeniq, more of the corn can be used, making it possible to produce ethanol that requires less corn plantings and could prove to be a lower carbon fuel. And, if breakthroughs being developed by Edeniq are fully realized, the company might just crack the code on the next big California-based innovation to transform the transportation fuel industry. Take, for example, the Edeniq Cellunator – a specially designed, industrial-grade grinder that is integrated into existing corn ethanol plants and chews up corn biomass (starch and fiber) to allow ethanol plants to process a larger percent of the corn plant. The Cellunator often works in conjunction with the company’s PATHWAY enzyme platform, which can convert corn starch and corn fiber into useable ethanol. Finally, Edeniq’s bolt-on cellulosic technology (currently in pilot form) can allow existing ethanol plants to be modified into facilities that can also produce cellulosic ethanol – breaking down biomass like corn stover and turning it into cellulosic sugar for further processing into fuel. What does all this technology and innovation add up to? Edeniq’s technology looks to be an incremental, yet major step towards breaking open a market for cellulosic ethanol – one that fuel producers have long sought. If ethanol producers can take advantage of more parts of the corn plant and earn accreditation by the California Air Resources Board – the process of producing ethanol can also be certified as lower carbon and earn credits under regulations like the Low Carbon Fuel Standard (LCFS). An Edeniq worker at the company’s pilot plant in Visalia. Edeniq isn’t going it alone however, and partners with companies like California-based Pacific Ethanol (which has used the Cellunator and is planning to add PATHWAY) to produce alternative fuels. After full installation, Edeniq predicts that Pacific Ethanol will be able to produce an additional 1.8 million gallons of ethanol, using less feedstock. 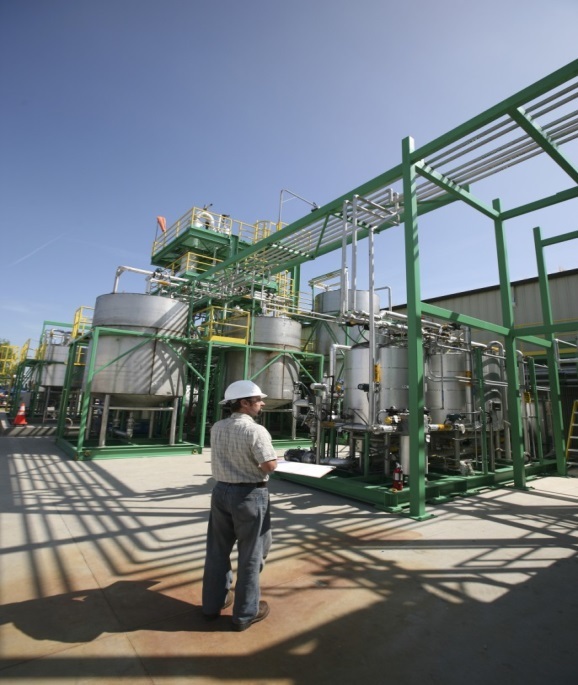 As California transitions to a cleaner fuel system, given the impending expansion of the cap-and-trade program to include fuels, as well as the LCFS, innovative companies like Edeniq will see an increased role in the market as they facilitate what could prove to be a low-cost and lower carbon way to increase biofuel production with less waste. *Despite having the same, undeniably great last name, Mr. Koehler is no relation to the author. This entry was posted in California Innovators Series, Cap and trade, Climate, Global Warming Solutions Act: AB 32, Low Carbon Fuel Standard. Bookmark the permalink. Both comments and trackbacks are currently closed.